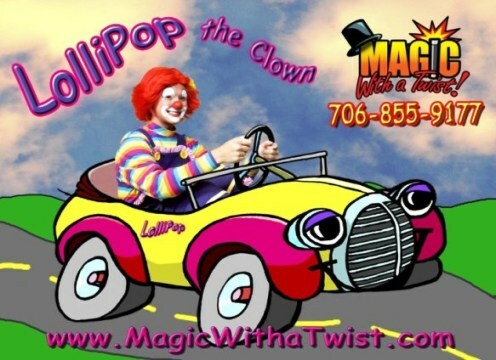 Magic With A Twist is proud to offer LolliPop the Clown! You may wonder if she is a real red head. Only her hairdresser �Calvin Clown� knows for sure! 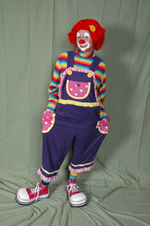 LolliPop loves to shop at �Clowningdales� and she buys her shoes at �Toes R Us". Silliness aside, LolliPop will make any event a hit with both the kids and adults. 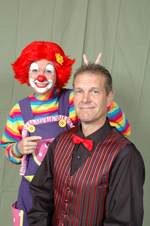 She�s ready to tickle your funny bone with her balloon sculpting, face painting and games. LolliPop can also host a Be a Clown Birthday Party where all the guests are made up to look like LolliPop�s zany friends. Each child is given a clown makeover included their choice of wild hair color and an official LolliPop the Clown nose. At the end of the party, everyone looks silly and can clown around for hours. LolliPop�s slapstick comedy and sweet disposition is "G-rated" for giggles and grins.